Scott Peden and colleague at the base of his namesake tree – the tallest tree in the Santa Cruz Mountains at 352 feet tall. The Scott Peden tree is the one in the photo with the divided top. For more about this remarkable tree and Scott, click here. 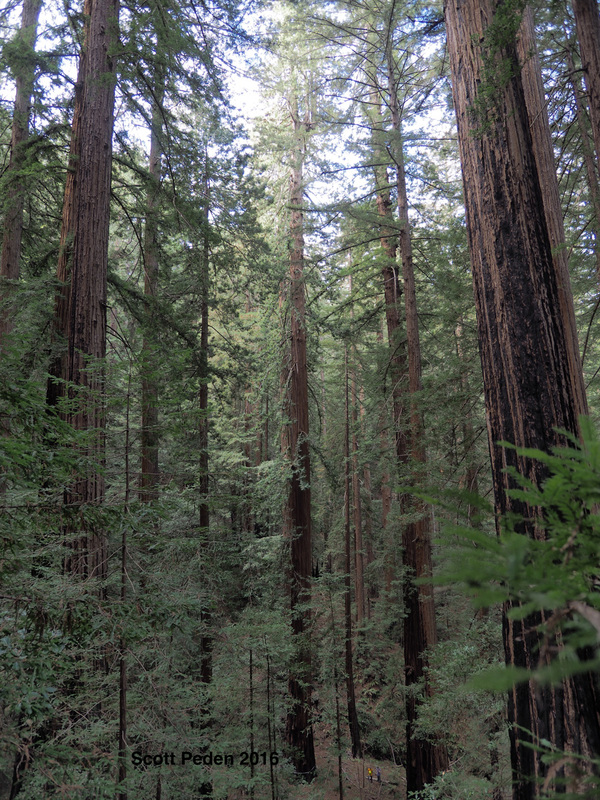 What is the Santa Cruz Mountains Bioregional Council and Why Does it Matter to You? The Santa Cruz Mountains Bioregional Council is a non-profit public benefit corporation that serves the 7 million people who live or work in the greater Santa Cruz Mountains area which includes San Francisco, San Mateo County, the Santa Clara Valley, and Santa Cruz County. Our goal is to protect the quality of life for all who live or work therein and to maintain the health and productivity of the natural resources found within this area. We do this by promoting the use of scientific findings (facts not fake news) to maintain our region’s clean air, clean water, productive soils, and sustainable forests and woodlands. These attributes that we all enjoy are the product of healthy natural ecosystems and their supporting compliment of diverse and abundant native plants and animals. Governing the Council is a nine-member Board of Directors comprised of biologists and other natural resource professionals whose objective is to conserve native plant and animal biodiversity in the Santa Cruz Mountains Bioregion. The Santa Cruz Mountains Bioregion covers an area of 3,592 square kilometers (1387 square miles) on the central coast, bounded on the north by the Golden Gate, on the East by San Francisco Bay and the Santa Clara Valley, on the south by the Pajaro River and on the west by the Pacific Ocean. It includes all of San Francisco, San Mateo and Santa Cruz counties and the western part of Santa Clara County. The region is essentially one of heavily populated lowlands surrounding a core of forested uplands, with small to large pockets of everything from salt marsh to chaparral intermixed. It is rich in endemics and many other natural features of special interest, some of whose past and current distributions are well known, others hardly at all. November 18, 2018 — We Mourn the Loss of Fellow Board Member Fred McPherson. We are saddened to report that Fred McPherson, a long-time member of the Santa Cruz Mountains Bioregional Council board, passed away on November 8. He was 80 years old, although no one would have guessed it. Fred spent the last 50 plus years of his life working to preserve the natural beauty and biodiversity of the Santa Cruz Mountains. Learn more about his remarkable life in service to humankind through the protection and enhancement of our natural environment here. August 14, 2018 — Bioregional Council Trains Local Biologists to Survey for Marbled Murrelets. In cooperation with the San Mateo County Parks Department and the California State Parks Department, the Bioregional Council co-sponsored a murrelet surveyor training class during the last week of June. Read more about it here. Read about World Scientists' Warning to Humanity. Existing or former Board members have been interviewed about their work or passion. You can listen to their podcasts by clicking on their names: Jen Michelsen, Betsy Herbert, Portia Halbert, and Fred McPherson. Click on "Our Bioregion" above for information on Redwoods ..... Old-growth Forests ..... Sensitive Species and MORE! The Bioregional Council is dedicated to the preservation and enhancement of regional biodiversity over time through education, the dissemination of accurate scientific information and assistance in the planning, coordination and implementation of conservation efforts.